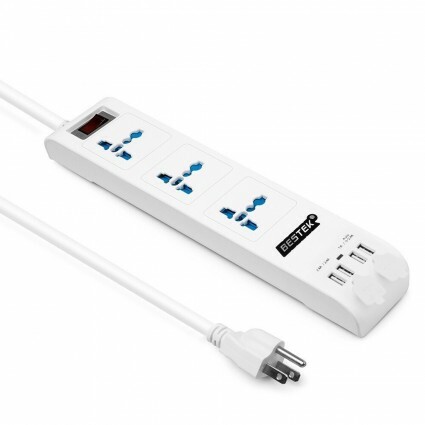 This surge protector power strip is universal with 3 outlets that can be used all over the world. Along with 4 USB charging ports, it is perfect for you to charging at least 4 digital electronics at same time. Compact and portable, it is an ideal travel companion. 3 AC outlets accept plugs from the world, ideal for your worldwide use and can protect your devices from power spikes, over-heated, overload and over-charging. Built with 4 USB ports, it allows you to charge 4 digital devices simultaneously fast and efficiently, up to 5.2A totally. Smart USB ports power down if a short circuit is detected. Lighted on/off switch with integrated circuit breaker for overload protection of all outlets; Heavy duty fire-resistant material and high quality components used for safeguard. Built-in EMI noise reduction to protect all connected devices. Sleek and slim, it is easy to use for both home and office and convenient for traveling. Keyhole slots on the back of the power strip allow you to mount it on the wall or baseboard. This power strip cannot convert voltage.